Our Personalized Walking For Breast Cancer Awareness T-shirt is a great way to show your support for Breast Cancer Awareness. Proudly display who you are walking for with this unique Breast Cancer Walk Shirt and show your never-ending commitment to find a cure. Got this one for my daughter. For your next breast cancer walk, show the world who has inspired you to fight for this cause by wearing this personalized t-shirt! 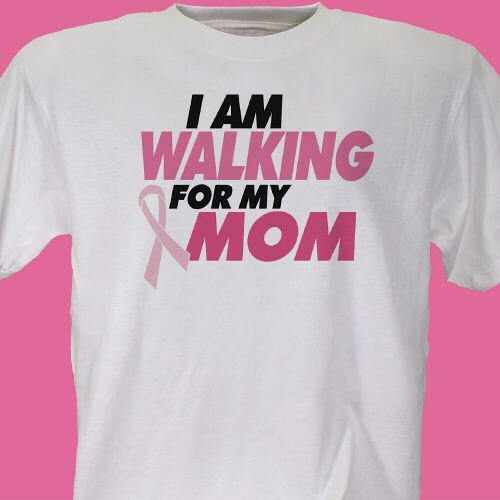 This is one of many breast cancer apparel items we offer on the site that would be perfect to wear at your next walk. Our Cancer Awareness T-Shirt is another great shirt that you can wear at your next event.